Martin Nørgaard Furze was looking for a job and wanted to create and impactful job application that stood out from the rest. 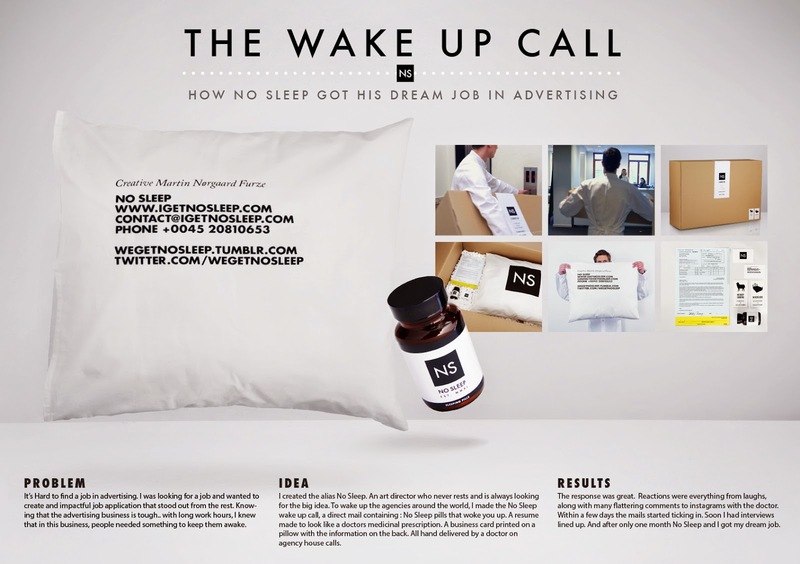 Martin, and brilliant young art director created The No Sleep Wake Up Call, a direct mail containing : No Sleep pills that woke you up. A resume made to look like a doctors medicinal prescription. A business card printed on a pillow with the information on the back. All hand delivered by a doctor on agency house calls. No Sleep pills that woke you up. A resume made to look like a doctors medicinal prescription. A business card printed on a pillow with the information on the back. All wrapped up in a box and hand-delivered by a doctor on agency house calls.